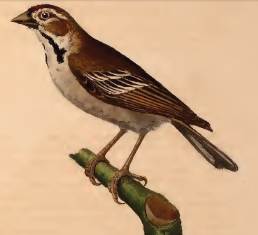 The Chestnut-crowned Sparrow-weaver was formally described by Philipp Jakob Cretzschmar, a German physician who founded the Senckenberg Natural History Museum in Frankfurt. Wilhelm Peter Eduard Simon Ruppell, a German naturalist and explorer. Ruppell made two extended expeditions to northern and eastern Africa, the first from 1822-1827 (when he collected the Chestnut-crowned Sparrow-weaver), and the second between 1830 and 1833. Ruppell probably collected the specimens near El Obeid, capital of Kordofan (Steinbacher 1949), Sudan. Ruppell and his colleague Cretzschmar, described many new species based on Ruppell's collections. 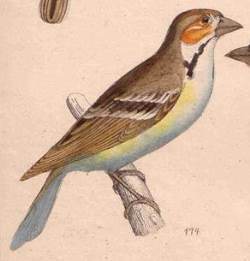 The first illustration of a Chestnut-crowned Sparrow-weaver is a colour painting by Cretzschmar 1827. The next published illustration is by Reichenbach 1863, again in colour. Ploceus superciliosus	Cretzschmar 1827 In Ruppell's Atlas, Vogel, p.24, pl. 15	Kordofan, Sudan. Chestnut-crowned Sand-Finch, The eyebrowed Philagrus, Cameroon Sparrow-Weaver. Probably El Obeid region, capital of Kordofan (Steinbacher 1949), Sudan. Two types are in Senckenberg but others are possible (Steinheimer 2005).